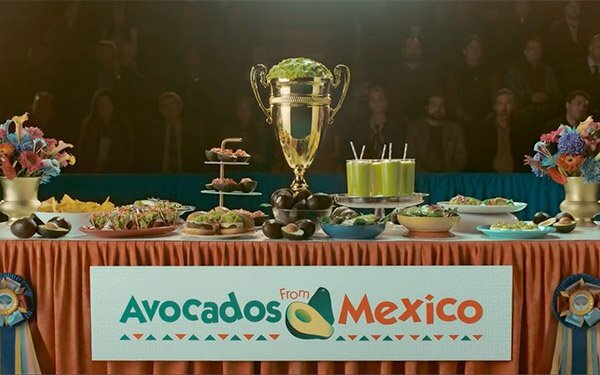 Avocados from Mexico ran a television and search campaign during Super Bowl LIII 2019. In the moments the ad ran, the campaign increased website traffic by more than 2000% -- up from 400% during the same time in the prior year. Advocado, a startup advertising firm, pulled it off with help from Havas Media in just six days prior to the TV spot airing. Relying only on television no longer works, especially when factoring in the $5.25 million, the estimated cost of a 30-second TV ad during this year's Super Bowl. This year marketers will spend less on television media, according to eMarketer. The analyst and data firm estimates TV ad spend will decline 2.2% to $70.83 billion this year, basically due to the lack of investments from elections, Olympics, World Cup or other big events. Avocados from Mexico works with seven digital agencies, but for this Super Bowl ad, Havas Media took the lead for media and paid search. Despite hitting a roadblock, Kinser wants to run a similar campaign for Cinco de Mayo. Here’s how it works: Imagine running out of guacamole dip while watching the Super Bowl on TV. and seeing a commercial for Avocados from Mexico. So you take out your phone and search for “Avocados from Mexico near me” on Google or Bing. Advocado’s platform decodes a digital watermark edited in the broadcast signal as the commercial starts. It then connects to Google Ads through an API that adjusts the bids on predetermined keywords to position the Avocados from Mexico ads at the top of query results. “The bid adjustment is done on Google even before someone reaches for their phone to do a search,” said Brian Handrigan, CEO and cofounder of Advocado. After the TV commercial finishes airing, the adjusted bids are reset to their pre-optimization levels. Advocado’s platform takes in data from several feeds. One comes from Kantar, a WPP Group company, its underlying Broadcast Verification technology that produces a digital watermark allowing marketers, within five seconds, to precisely identify when and where an ad runs. Handrigan said Advocado uses the technology to create broadcast-to-digital attribution reports in real time, as well as activating search campaigns. Advocado works with between 12 and 15 brands since launching the platform in September 2018. One of the first clients was Blue Cross Blue Shield during open enrollment, he said. “We’re also about to release a product that works with the multichannel video programming distributor cable operators,” Handrigan said.